Wonder Woman #31 Review – AiPT! James Robinson starts his “Children of the Gods” with a prologue to setup the big threat in this story, albeit without much action involving Wonder Woman herself. James Robinson makes his return to DC Comics with Wonder Woman #31, kicking off the “Children of the Gods” arc with a literal lightning bolt. Part one is an action-packed prologue, setting up a story that is linked to Justice League: Darkseid War. We’ll find out who Wonder Woman’s brother is eventually, but this first issue doesn’t involve much action from Diana herself. “Children of the Gods” part one! Spinning out of the pages of DC UNIVERSE REBIRTH and JUSTICE LEAGUE: DARKSEID WAR, legendary writer James Robinson (JSA: THE GOLDEN AGE, STARMAN) comes on board to answer one of the biggest questions of the year: Who is Wonder Woman’s brother? Taken away from Themyscira in the dead of night, the mysterious Jason has been hidden somewhere far from the sight of gods and men…but his life and Wonder Woman’s are about to intersect in a terrifying way, bringing them face to face with a cosmic threat they never imagined! 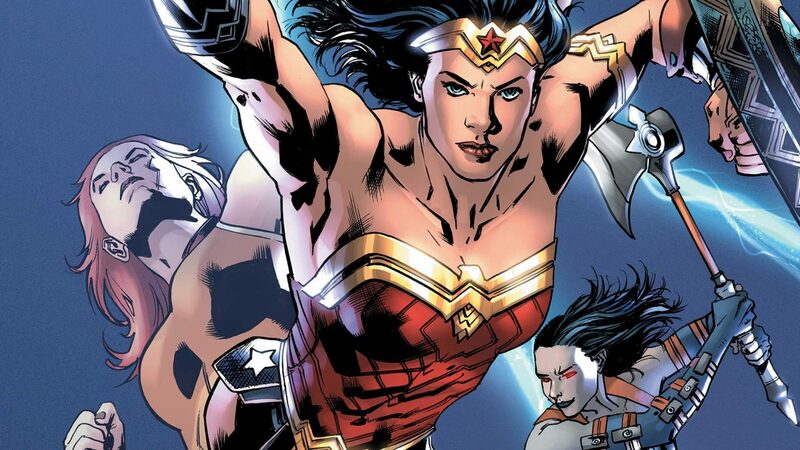 Don’t miss the start of the next great Wonder Woman epic! “Children of the Gods” starts with an epic splash page by Carlo Pagulayan (Batman & Robin Eternal), showing Wonder Woman shielding herself from a lightning bolt, but that image is quickly shoved to the side. That’s because we’re then introduced to a man named Paul Jackson. Of course that’s just for cover because he’s really a god with super strength (I’ll keep his real name a surprise). Darkseid’s daughter Grail shows up though, ruining Paul’s peace. Since this issue is purely a prologue to set up the goal of Darkseid, Wonder Woman doesn’t show up again until late in the issue. We find her in Los Angeles with Steve Trevor after fighting Giganta. Her victory celebration is interrupted by a lawyer with some surprising news. Robinson’s first issue is, again, just the setup for the rest of “Children of the Gods.” It’s hard to tell how this will develop, but it looks like we’ll have a clash between Wonder Woman’s old gods and the New Gods of the Fourth World. What we can say though is that the art by Pagulayan is excellent, filled with wonderful action that bursts from the panels. Robinson is the third writer on Wonder Woman since Rebirth, and it’s not clear how different his take on the character will be. He also has to prove why Wonder Woman is the character to deal with Darkseid instead of Superman or the Justice League together. James Robinson starts his "Children of the Gods" with a prologue to setup the big threat in this story, albeit without much action involving Wonder Woman herself. This is a good prologue, setting up a big threat for Wonder Woman that she doesn't know about yet. Carlo Pagulayan's art continues the string of excellent artists working on Wonder Woman. There's very little Wonder Woman action in this particular issue. So while it's a good set-up for a potentially big DC universe story, it's not a great Wonder Woman issue.